To Cite: Kolawole O M, Kana S N. Hepatitis B Virus and Malaria Co-infection Causing Significant Changes in Hematological and Liver Function Indices in a Cohort of Subjects in Ilorin, Nigeria, Int J Infect. 2018 ; 5(3):e81528. doi: 10.5812/iji.81528. Methods: Blood samples from 200 febrile patients were collected and analyzed for the presence of HBV surface antigen (HBsAg) and malaria infection. Hematological parameters and liver function tests such as bilirubin, albumin, alkaline phosphatase (ALP), aspartate aminotransferase (AST), and alanine aminotransferase (ALT) were carried using automated systems. Malaria parasite test was carried out using CareStart TM while HBsAg detection was done using MonolisaTM immunoassay. Descriptive statistics were carried out to ascertain the relationship between the prevalence of the infections and these parameters. Results: 62 (31.0%) subjects were positive for malaria parasite infection while 138 (69%) were negative. There were no significant changes in the hematological parameters of the subjects with respect to the prevalence of malaria. In addition, 38 (19.0%) subjects were found to be positive for HBsAg and 162 (81.0%) were negative. Of all the liver function tests carried out, only alkaline phosphate was found to be significantly affected (P value = 0.003) by the prevalence of HBsAg. The results further revealed that co-infection among the subjects significantly affected the hematological parameters such as Neutrophils (P value = 0.0134), lymphocytes (P value = 0.0002), eosinophils (P value = 0.0367), and white blood cells (P value = 0.01), as well as liver function indices such as ALT (P value = 0.001), ALP (P value = 0.001), bilirubin (P value = 0.01), and conjugated bile (P value = 0.021). Conclusions: Individuals with HBV and malaria co-infection tend to have a higher level of changes in their disease conditions compared to those with mono-infections. Hence, there is a need for continuous monitoring of individuals presenting with febrile illnesses in the areas where HBV and malaria infections are co-endemic. Hepatitis B virus (HBV) and malaria infections are endemic in most parts of Nigeria and Sub-Saharan Africa (1). HBV causes infectious diseases resulting in liver conditions that could be of immense danger to human health (2). HBV is known to infect about 2 billion persons across the globe with about 280 million chronic carriers of the virus (2). While HBV infection could sometimes be asymptomatic and transient in most individuals, it can cause short-term illnesses in some people and result in chronic infections in others (3). Malaria is another infectious disease plaguing developing countries and Sub-Saharan Africa. About 212 million cases and 429000 deaths occurred in 2015 alone because of malaria (4). In Nigeria, HBV is prevalent and widespread as about 75% of the total population is exposed to it. Various reports have shown different prevalence rates of HBV among different Nigerian populations. Emechebe et al. (5) reported a prevalence rate of 10-15% among a cohort of average risk Nigerians. 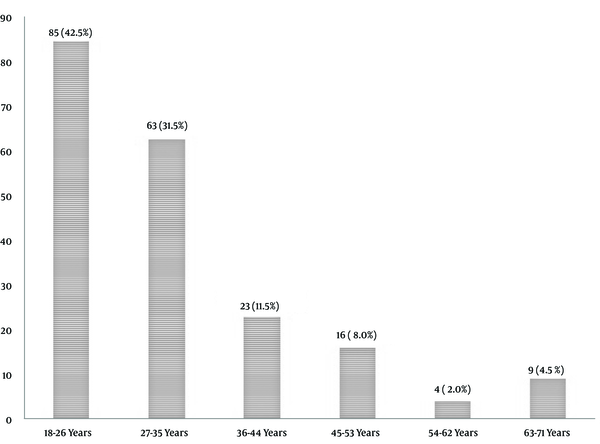 Sadoh and Sadog (6) reported a prevalence of 16.3% and Mbaawuaga et al. (7) reported a prevalence of 11% among a group of pregnant women. In addition, Kolawole et al. (8) reported a prevalence rate of 16.5% among a cohort of pregnant women in Oshogbo, Nigeria. Risk factors for HBV infection acquisition include contact with contaminated blood, body piercing, indiscriminate percutaneous drug use, and acupuncture (2, 9-11). Malaria is endemic in Nigeria with the disease accounting for about 60% of outpatient visits to clinics and health facilities. 132 billion Naira is said to be lost annually in Nigeria because of malaria (12). The presence of malaria has been shown to be a risk factor contributing to the prevalence of other infections or diseases (13). The presence of HBV and malaria co-infection is usually predominant in areas where both infections are endemic as mono-infection (14). HBV and malaria are known to share some of their developmental stages in the liver, which has sometimes been attributed to the poor clearance of the liver stage of the malaria parasite (15). Co-infection of Malaria and HBV may occur in areas where both infections are endemic and because of their geographical coincidence (14, 16). These two infections share some of their developmental stages within the liver, which may cause an impaired clearance of the liver stages of Malaria parasite due to hepatocytes damage in HBV infection (15, 17). Individually, malaria parasite infection causes changes in hematological parameters while HBV infection causes changes in liver function indices. Despite that, a few kinds of literature have studied the effect of HBV and malaria co-infection in a cohort of the subject. This study thus aimed to establish if any, significant changes in the liver function indices and hematological parameters in a cohort of subjects, both as mono-infection and as co-infection. This was a cross-sectional descriptive study carried out among a cohort of febrile subjects, attending General and Specialist Hospitals in Ilorin Kwara state, above the age of 17 years who gave their consent to participate in the study. A structured closed-ended questionnaire was administered to these subjects after an informed consent form had been filled, followed by the collection of blood samples. Subjects were recruited randomly from a cohort of febrile patients attending the study hospitals. As part of the inclusion and exclusion criteria, subjects recruited had not been tested for HBV in the past. This study was conducted in three different areas of Ilorin that were East, West, and South, Kwara State, Nigeria. Approval for the study was obtained from the Ethical Review Committee of the Ministry of Health, Ilorin after which, informed consent was obtained from the subjects. The study was done at no financial cost to the subjects, and information of the subjects was kept confidential. Patients were bled from the antecubital vein using 5 mL syringes. Three (3) mL of blood was transferred into clean dry bottles, allowed to clot, and centrifuged at 3000 rpm for 5 min. The supernatant (serum) was then collected and kept in clean, dry cryo bottles and stored in a deep freezer at -70 °C. It was removed only when needed. 2 mL of blood was poured into EDTA bottles, mixed to avoid clotting, and used for Malaria parasites and Full blood count. While hematological parameters were analyzed as described by Kolawole et al. (8) using an automated analyzer, liver function tests such as bilirubin, albumin, alkaline phosphatase (ALP), aspartate aminotransferase (AST), and alanine aminotransferase (ALT) were carried using an automated analyzer and kits from Inteco Diagnostics UK LTD.
CareStart TM Malaria HRP (pf) with a sensitivity and specificity of 95% was used for the rapid qualitative detection of malaria HRP2 (Histidine-rich protein 2) in human blood as an aid in the diagnosis of malaria Plasmodium falciparum infection. The test procedure was made using blood samples from EDTA bottles where five microliters (5µL) of blood was added into the “S” well and 3 drops of assay buffer solution added into the “A” well. A start timer was set for 20 min and results were read visually. Serum samples kept in a freezer at -70°C were thawed at room temperature for 20 min before the assay procedure. Serum samples for study participants were screened for HBsAg using a MonolisaTM HBsAg ULTRA kit (with a specificity of 99.28% and sensitivity of 100%) by the Enzyme Immunoassay (EIA) technique. This technique is a qualitative one-step enzyme immunoassay based on the principle of “sandwich” type using monoclonal antibodies and polyclonal antibodies selected for their ability to bind themselves to the various subtypes of HBsAg. The cut-off (CO) value was determined with the negative control, by calculating the mean measured absorbance value for the four negative controls. The cut-off value becomes the mean of negative control +0.050. The presence or absence of HBsAg was determined by comparing the registered absorbance to the calculated cut-off value for each sample. Samples with an optical density (OD) value lower than the cut-off value were considered negative (ratio < 1) by MonolisaTM HBsAg ULTRA. Descriptive analysis using SPSS 21 was used to describe the mean, frequency, standard deviation, standard error, correlation, and percentage. Graphs and chats were also used in order to have a lucid representation of data. The results showed a higher percentage of the subjects (85, 42.5%) was between the ages of 18 and 25 years (Figure 1). 132 (66.0%) subjects were married, 67 (33.5%) were single, and only one (0.5%) subject was divorced. The gender distribution of the subjects revealed that the female gender group had a frequency of 128 (64%) while the male gender comprised 72 (36.0%) of the sample. Most of the respondents had tertiary education (99, 49.5%) while those without formal education had the least record of 13 (6.5%). The respondents with secondary and primary education were 60 (30.0%) and 28 (14.0%), respectively. The demographic information about the occupation of the respondents revealed that most of them were students 57 (28.5%). This was closely followed by the civil servants (55, 27.5%) and Traders (50, 25.0%) category. The least respondents were recorded within the group with other forms of occupation (38, 19.0%). The results of this study showed that 62 (31.0%) subjects were positive for malaria parasite infection while 138 (69%) were negative. Hematological parameters of the subjects in relation to the prevalence of Malaria are shown in Table 1. It was revealed that there were no significant changes in the hematological parameters of the subjects with respect to the prevalence of malaria. 38 (19.0%) subjects were found to be positive for HBsAg while 162 (81.0%) were negative. Liver function indices of the subjects with respect to the prevalence of HBsAg are shown in Table 2. Of all the liver function tests carried out, only alkaline phosphate was found to be significantly affected (P value = 0.003) by the prevalence of HBsAg. Co-infection of HBV and malaria was found among 11 subjects accounting for 5.5% of the study population. Tables 3 and 4 show the relationship between the prevalence of HBV and malaria co-infection with respect to their hematological and liver function parameters, respectively. aP value < 0.05 is statistically significant. Hepatitis B virus has been implicated largely in cases of liver diseases, resulting in lots of deaths worldwide. It is a major cause of chronic liver disease and hepatitis, with chronic hepatitis accounting for 620000 deaths per year (18). In addition, the presence of malaria and HBV co-infection has been known to influence the progression of either malaria, hepatitis, or both diseases (15). The results of this study clearly showed that young adults between the ages of 18 - 26 years participated most in this study. The socio-demographic characteristics of the study population were as seen in similar settings where the study was carried out. While females were more frequent (128, 64%), the educational level of the respondents varied across the different age groups. Similar results were shown by Udeze et al. (9). Hematological changes are a key feature of malaria infections (19). Various hematological abnormalities have been duly linked to the prevalence of malaria. They include Leucopenia, Neutropenia, Eosinophilia, leucocytosis, and Neutrophilia (20). The results of this study showed that the presence of malaria mono-infection in the respondents did not affect the majority of the hematological parameters evaluated. Although 44 out of the 62 subjects positive for malaria had low PCV, there was no statistical significance between the presence of malaria as mono-infection and the PCV of the subjects. The same was applicable for neutrophil, lymphocyte, eosinophils, white blood cells, and monocyte levels of the respondents. Lower neutrophil and leukocyte counts are usually indicative of leucopenia (21) but this was not found in this study among subjects with malaria mono-infection. Leucopenia occurs because of the localization of leucocytes away from the peripheral circulation, marginal pools, and splenic sequestration (22). Tchinda et al. (23) in their study of the impact of malaria on hematological parameters in people living with HIV/AIDS attending the Laquintinie Hospital in Douala discovered that the presence of malaria in the subjects did not significantly affect the hematological parameters of the subjects. However, Kotepui et al. (24) affirm that malaria infection affected significantly hematological parameters of their study population. The results of this study further showed that individuals that were seropositive for HBV antigen mono-infection did not have major changes in their liver function indices. No significant difference was found between the prevalence of HBV and changes in the levels of ALT and AST among the subjects. However, a significant difference was found between the level of alkaline phosphate and the prevalence of subjects who were positive for HBV. In addition, no significant changes were found in the subjects’ bilirubin and conjugated bile concerning the prevalence of HBV. Contrary to this study, Du et al. (25) showed a significant change in bilirubin level among a cohort of Chinese subjects. The high level of liver bilirubin is usually associated with liver injury (25). In addition, Dixit et al. (26) showed significant changes in liver function indices among subjects with hepatitis B virus infection. However, these subjects had chronic hepatitis B virus infection albeit asymptomatic. Liver function test (LFT) abnormalities have been shown to occur in Nigeria in subjects with chronic liver disease or with liver infection occurring as a co-infection with other diseases. HBV and malaria co-infection are co-endemic in Nigeria and most other countries in Sub-Saharan Africa (27). In this study, a 31% malaria prevalence rate was found among the subjects, with 38% of the subject positive for HBV antigen. 5.5% of the subjects had HBV and malaria co-infection. Some studies have shown the co-infection prevalence of HBV and malaria among various subjects. Omalu et al. (28) recorded a co-infection prevalence rate of 7.8% among a group of pregnant Nigerian women and a 1.8% co-infection rate was found in a cohort study in Brazil by Braga et al. (29). In a similar study by Dabo et al. (27) in Kano, an HBV malaria co-infection rate was reported. The presence of HBV and malaria co-infection among subjects in this study significantly affected not only the hematological parameters of the subjects but also their liver function indices. Hematological parameters that were hitherto not influenced by the presence of malaria as a mono-infection were largely affected in subjects with HBV and malaria co-infection. Similarly, there were significant changes in the liver function test of subjects with HBV and malaria co-infection compared to subjects with HBV mono-infection. The levels of ALT, bilirubin, and conjugated bile that were not significantly affected by the presence of HBV as a mono-infection became significantly influenced in subjects with HBV and malaria co-infection. The result of this study is supported by the work of Mazie et al. (30), who showed the presence of HBV could significantly negatively affect the prognosis of malaria infection. This is contrary to the results reported by Dabo et al. (27) who showed reduced parasitaemia among subjects with HBV and malaria co-infection. They opined that the increased level of Interferon gamma (IFN), which is often released during an HBV infection, could lead to a reduction in malaria parasite load, resulting in a reduction in the severity of malaria infection. However, Freimanis (14) indicated that the presence of HBV and malaria as a co-infection did not significantly affect the prognosis of either infection. Although Sharif et al. (1) in their study of a cohort of subjects in Kano, Nigeria, showed a 9.0% co-infection prevalence rate of HBV and malaria and changes in AST and ALT, there was no direct comparison using these parameters on subjects with mono or co-infections. The results from this study clearly negate theories that have suggested the presence of HBV and malaria as a co-infection reduces the severity of HBV and malaria as mono-infections (1). Subjects with co-infection of HBV and malaria as seen in this study are at a higher risk of experiencing liver dysfunction, compared to those with mono-infections. 1. Sharif AA, Dabo NT, Getso MI, Yusuf I, Muhd IZ, Ahmad IM. Liver function biomakers in malaria and hepatitis b co-infection among patients with febrile illness in kano metropolis. Int J Biol Med Res. 2016;7(1):5377-80. 2. World Health Organization. Guidelines for the Prevention, Care And Treatment Of Persons With Chronic Hepatitis B Infection. 2015. 3. Centre for Disease Control and Prevention. Hepatitis B FAQs for the Public. 2016, [cited February 13]. Available from: https://www.cdc.gov/hepatitis/hbv/bfaq.htm. 4. World Health Organization. 10 Facts about malaria. 2016, [cited February 13]. Available from: http://www.who.int/features/factfiles/malaria/en/. 5. Emechebe GO, Emodi IJ, Ikefuna AN, Ilechukwu GC, Igwe WC, Ejiofor OS. Hepatitis B virus infection in Nigeria - A review. Niger Med J. 2009;50:18-22. 6. Sadoh AE, Sadoh WE. Serological markers of hepatitis B infection in infants presenting for their first immunization. Niger J Paeadiatr. 2013;40:248-53. 7. Mbaawuaga EM, Enenebeaku MN, Okopi JA, Damen JG. Hepatitis B Virus (HBV) Infection among Pregnant Women in Makurdi, Nigeria. Afr J Biomed Res. 2008;11:155-9. 8. Kolawole OM, Wahab AA, Adekanle DA, Sibanda T, Okoh AI. Seroprevalence of hepatitis B surface antigenemia and its effects on hematological parameters in pregnant women in Osogbo, Nigeria. Virol J. 2012;9:317. doi: 10.1186/1743-422X-9-317. [PubMed: 23268985]. [PubMed Central: PMC3546843]. 9. Udeze AO, Aliyu AS, Kolawole OM, Okonko IO, Sule WF, Akanbi K. Hepatitis B surface antigenaemia and risk factors of transmission among apparently healthy students of University of Ilorin, Ilorin-Nigeria. Scientia Africana. 2012;11(2). 10. Kolawole OM, Adu FD, Agbede OO, Oni AA, Bakare RA. Epidemiological Patterns of Human Immunodeficiency Virus and Herpes Simplex Virus Co-infection in Ibadan, Nigeria. Afr J Biomed Res. 2008;11:204-6. 11. Beasley RP, Hwang LY, Lee GC, Lan CC, Roan CH, Huang FY, et al. Prevention of perinatally transmitted hepatitis B virus infections with hepatitis B immune globulin and hepatitis B vaccine. Lancet. 1983;2(8359):1099-102. [PubMed: 6138642]. 12. National Malaria Control Programme. 2017, [cited February 11]. Available from: http://www.nmcp.gov.ng/. 13. Boraschi D, Abebe Alemayehu M, Aseffa A, Chiodi F, Chisi J, Del Prete G, et al. Immunity against HIV/AIDS, malaria, and tuberculosis during co-infections with neglected infectious diseases: recommendations for the European Union research priorities. PLoS Negl Trop Dis. 2008;2(6). e255. doi: 10.1371/journal.pntd.0000255. [PubMed: 18575596]. [PubMed Central: PMC2427178]. 14. Freimanis GL, Owusu-Ofori S, Allain JP. Hepatitis B virus infection does not significantly influence Plasmodium parasite density in asymptomatic infections in Ghanaian transfusion recipients. PLoS One. 2012;7(11). e49967. doi: 10.1371/journal.pone.0049967. [PubMed: 23185500]. [PubMed Central: PMC3503819]. 15. Aernan PT, Sar TT, Torkula SH. Prevalence of Plasmodia and hepatitis B virus co-infection in blood donors at Bishop Murray Medical Centre, Makurdi, Benue State, Nigeria. Asian Pac J Trop Med. 2011;4(3):224-6. 16. Andrade BB, Santos CJ, Camargo LM, Souza-Neto SM, Reis-Filho A, Clarencio J, et al. Hepatitis B infection is associated with asymptomatic malaria in the Brazilian Amazon. PLoS One. 2011;6(5). e19841. doi: 10.1371/journal.pone.0019841. [PubMed: 21625634]. [PubMed Central: PMC3097216]. 17. Thursz MR, Kwiatkowski D, Torok ME, Allsopp CEM, Greenwood BM, Whittle HC, et al. Association of hepatitis B surface antigen carriage with severe malaria in Gambian children. Nat Med. 1995;1(4):374-5. doi: 10.1038/nm0495-374. 18. Musa BM, Bussell S, Borodo MM, Samaila AA, Femi OL. Prevalence of hepatitis B virus infection in Nigeria, 2000-2013: a systematic review and meta-analysis. Niger J Clin Pract. 2015;18(2):163-72. doi: 10.4103/1119-3077.151035. [PubMed: 25665986]. 19. Richards MW, Behrens RH, Doherty JF. Short report: hematologic changes in acute, imported Plasmodium falciparum malaria. Am J Trop Med Hyg. 1998;59(6):859. doi: 10.4269/ajtmh.1998.59.859. 20. Jandle JH. Hemolytic anemias caused by infection of red blood cells. Blood. 2nd ed. New York: Little brown and company; 1996. p. 473-501. 21. Lathia TB, Joshi R. Can hematological parameters discriminate malaria from nonmalarious acute febrile illness in the tropics? Indian J Med Sci. 2004;58(6):239-44. [PubMed: 15226575]. 22. McKenzie FE, Prudhomme WA, Magill AJ, Forney JR, Permpanich B, Lucas C, et al. White blood cell counts and malaria. J Infect Dis. 2005;192(2):323-30. doi: 10.1086/431152. [PubMed: 15962228]. [PubMed Central: PMC2481386]. 23. Tchinda GG, Atashili J, Achidi EA, Kamga HL, Njunda AL, Ndumbe PM. Impact of malaria on hematological parameters in people living with HIV/AIDS attending the Laquintinie Hospital in Douala, Cameroon. PLoS One. 2012;7(7). e40553. doi: 10.1371/journal.pone.0040553. [PubMed: 22802967]. [PubMed Central: PMC3393653]. 24. Kotepui M, Phunphuech B, Phiwklam N, Chupeerach C, Duangmano S. Effect of malarial infection on haematological parameters in population near Thailand-Myanmar border. Malar J. 2014;13:218. doi: 10.1186/1475-2875-13-218. [PubMed: 24898891]. [PubMed Central: PMC4053303]. 25. Du M, Zhang S, Xiao L, Xu Y, Liu P, Tang Y, et al. The Relationship between Serum Bilirubin and Elevated Fibrotic Indices among HBV Carriers: A Cross-Sectional Study of a Chinese Population. Int J Mol Sci. 2016;17(12). doi: 10.3390/ijms17122057. [PubMed: 27941693]. [PubMed Central: PMC5187857]. 26. Dixit VK, Panda K, Babu AV, Kate MP, Mohapatra A, Vashistha P, et al. Asymptomatic chronic hepatitis B virus infection in northern India. Indian J Gastroenterol. 2007;26(4):159-61. [PubMed: 17986740]. 27. Dabo NT, Sharif AA, Muhammed Y, Sarkinfada F. Malaria and Hepatitis B co-infection in patients with febrile illnesses attending general outpatient unit of the Murtala Muhammed Specialist Hospital, Kano, Northwest Nigeria. Bayero J Pure Appl Sci. 2015;8(1):89. doi: 10.4314/bajopas.v8i1.16. 28. Omalu ICJ, Jibrin A, Olayemi IK, Hassan SC, Mgbemena C, Mgbemena A, et al. Seroprevalence of malaria and hepatitis B (HBsAg) with associated risk factors among pregnant women attending antenatal clinic in general hospital Minna, North-Central Nigeria. Annu Rev Res Biol. 2012;2(4):83-8. 29. Braga WS, Silva EB, Souza RA, Tosta CE. [Seroprevalence of hepatitis B and malaria infection in Labrea, Brazilian western Amazon: estimates of coinfection rates]. Rev Soc Bras Med Trop. 2005;38(3):218-23. [PubMed: 15895171]. 30. Barcus MJ, Hien TT, Laras K, White NJ, Schwartz IK, Farrar J, et al. Short report: hepatitis b infection and severe Plasmodium falciparum malaria in Vietnamese adults. Am J Trop Med Hyg. 2002;66(2):140-2. doi: 10.4269/ajtmh.2002.66.140.